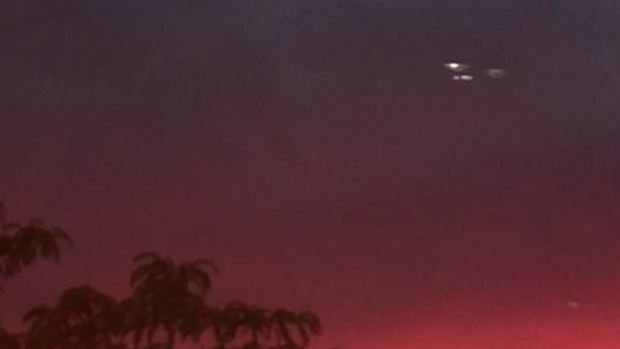 CONCORD, N.H. — New Hampshire resident Mike Pittaro captured mysterious moving light orbs in the sky which, he says, could only be seen through the lens of a camera. His find has many people wondering, what, exactly, was that? Pittaro spotted the so-called UFOs just above the skyline near the Steeplegate Mall in Concord, NH, on Monday. In the video, which was shot after sunset, Pittaro stated that he moved away from the light post and could still see it. The object then changes shape. The lights separate and then regroup. Others in the parking lot confirmed they too could see the orbs. “After asking multiple people to use their cellphones, they too caught the exact same UFOs, verifying what we were recording,” Pittaro wrote in the thread. His video has been shared nearly 4,000 times on Facebook. “There’s something going on in our atmosphere,” he said.